I've been dreaming of painting a few doors in our house for some time now. I really want to tackle the front door, but I'm so indecisive on the color for the outside (I know I want the inside of it to be black). Our home is tan with cream trim and it definitely needs a little somethin' somethin' to wake up the front porch. I think a freshly painted front door (and new light fixture if I'm being greedy) will do just the trick. I love this gray and green combo. Our front door is not the only door I want to paint. We have far too many interior doors (including 4 pocket doors) to even think about painting so I'll leave them white. However, I do have an itch to paint the door in our laundry room that leads out into the garage. Right now it's a white door in a tan room with slate tile and a white washer and dryer. It needs something. A fun colored coat of paint on the door would be perfect---not to mention easy. You can paint one side of a door with only a sample size of paint in most cases...which means it would be a nice room update for less than $5! And if I use one of my many sample colors I already own, it'll be free! Decisions, decisions. I always love when I come across rooms that have a door in an unexpected color. 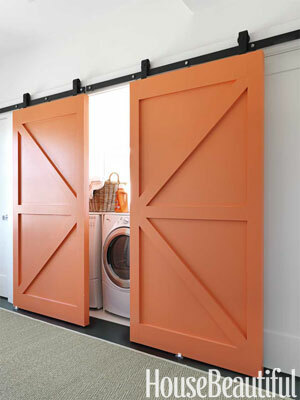 Painting a door in a different color makes it stand out and become a fun accessory in the space instead of a typical, overlooked necessity. Here's Emily's mint door from Little Green Notebook. Then there's these blue beauties. Everything about this kitchen is lovely, including the door. *Click on images for sources.